As one of the largest African countries in fishery production, Morocco is expected to boost the annual catch to 1.6m tonnes and triple the sector’s contribution to GDP by 2020. The stable fishery production level in recent years also makes seafood a very promising source of food to supplement the shortage in crops and livestock production due to drought. However, because the domestic fish market only gets the limited amount of fish from what is left from export, the most sustainable solution is to save the amount of fish that gets spoiled during transportation, which is now contributing to a large percentage of fish wasted. Our project aims to create a fishery distribution network from the major fishing ports to the populated inland cities. A shortest parth will be generated between the port and the city based on the road work analysis, and our algorithm decides the amount of fish that gets distributed to the city with reference to the population in that region. 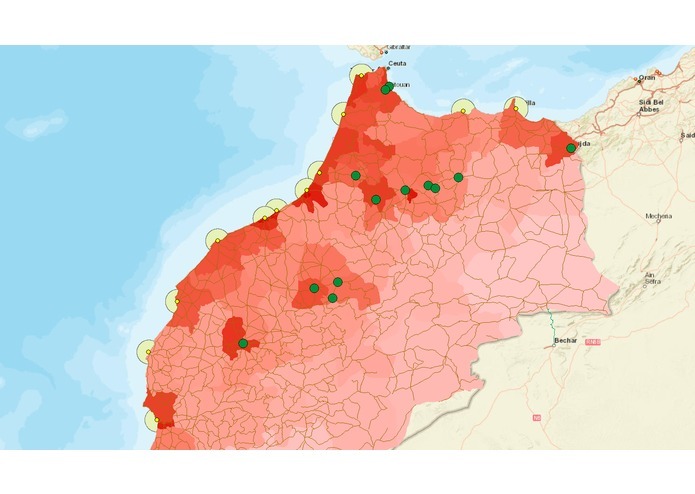 Built on a series of data including port location, road network, population centers, and fishery supply, most of our data were processed in Python, and will be demonstrated in QGIS. The team was able to develop a good methodology for classifying where the urban centers are. However, we were not able to get reliable data on the demand for fisheries. There was also a challenge on deciding which route analysis API works the best for our needs. The WebDemo directory is our attempt in visualizing the results but doesn't really contribute to this project. Anyway, it can be further developed in the future. I learned to work with developers and programmers as a spatial science specialists. Other team members gained experience in processing network analysis, as well as working with GeoJSON files. The next step will be looking into the need for fish as a substitute for food in rural areas in the west and south of Morcco.